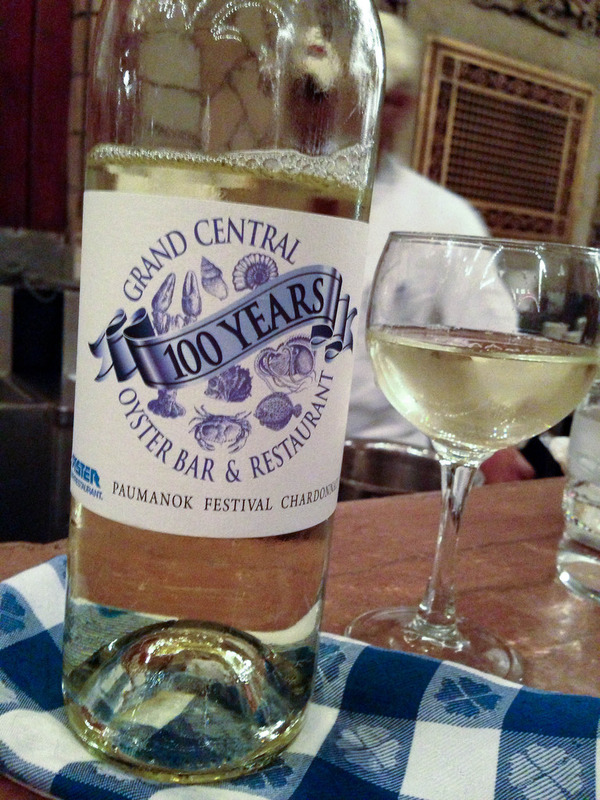 I was rather frightened when my lovely friends suggested a night out at The Grand Central Oyster Bar. I’ve only had oysters twice. Once in a very loud bar whilst very drunk which resulted in me being very, very sick and once in Whitstable Harbour – a much more pleasant experience that I can actually remember. Anyway, it is apparently the done thing when one is in New York so off we went. 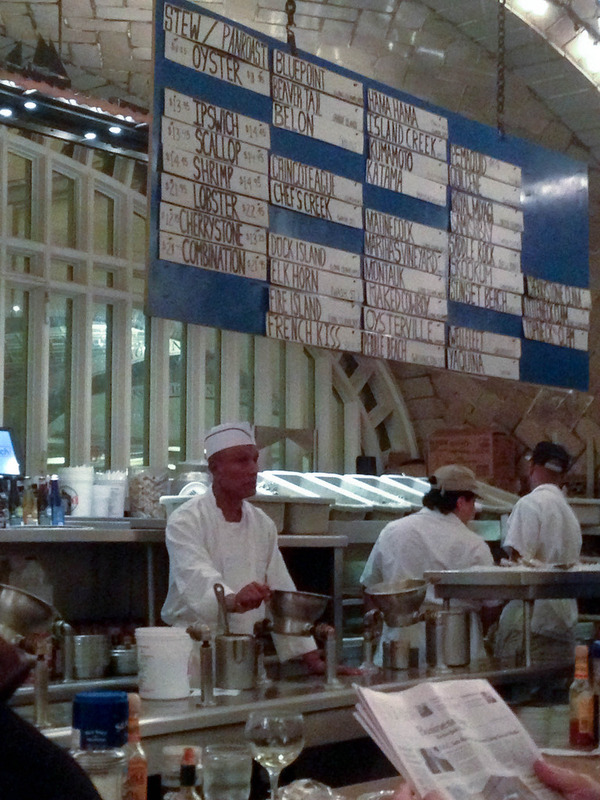 The Oyster Bar first opened in 1913 on the lower level of Grand Central Terminus. The United States was on the verge of World War I with Woodrow Wilson at the Presidential helm. Despite this, New York City was emerging as a literary and artistic centre attracting writers and artists. The new Grand Central Terminal opened its doors that year and people flocked to see one of the most beautiful structural accomplishments of the time. 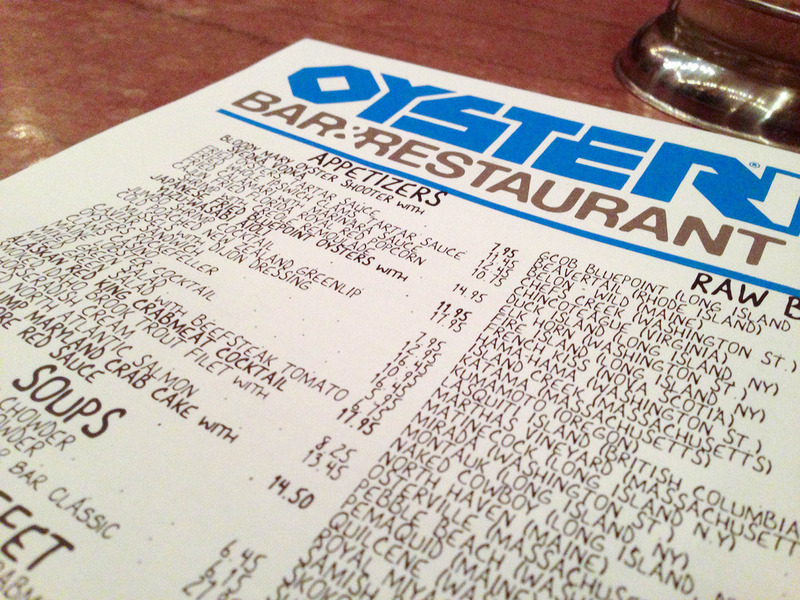 Since then the old Oyster Bar remained a landmark. But as the long-haul passenger train declined, so did the restaurant. It had no position among the trendy, artisan New York restaurants in Greenwich Village. The station was a means to an end rather than a destination for dining. In 1974, when the current owner, Jerome Brody, was approached to take it over, it had been bankrupt and empty for two years. The elegant marble columns were then painted aquamarine over wallpaper. The wall covering was yellow. The furniture was upholstered yellow with contrasting red tablecloths. Despite the clear drawbacks Mr Brody reinvented a new restaurant—from menu to decor—which would make The Oyster Bar a destination restaurant. What a brave decision – not unlike any restaurateur – but one which has paid dividends now, twenty years on, as customers new and old return because oysters just don’t taste the same anywhere else. The place to sit is at the bar – so we were told by our Manhattanite friends. 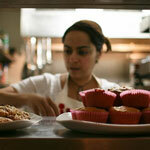 It houses the best view of the chefs and the bustle of preparation of a visible, working kitchen. 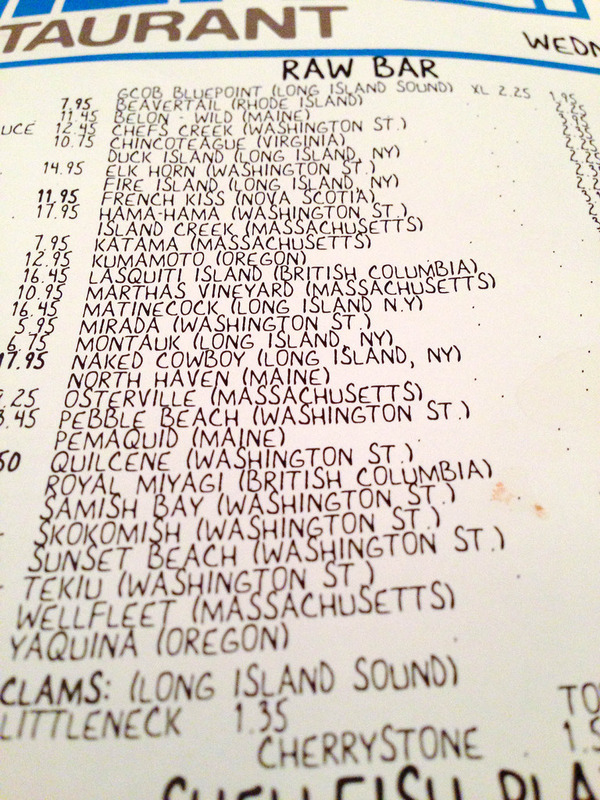 The menu is vast and goes beyond oysters to other seafood – mostly US sourced but with the odd foreign fish listing. There is also good, locally produced wine. Our bartender recommended this crisp white from Paumanok Vineyard in Long Island just up the road. I had no idea how much wine is produced on Long Island – it’s good too. A shame we don’t get much of it in the UK. I found the choice overwhelming. I had never seen so many different names and varieties. 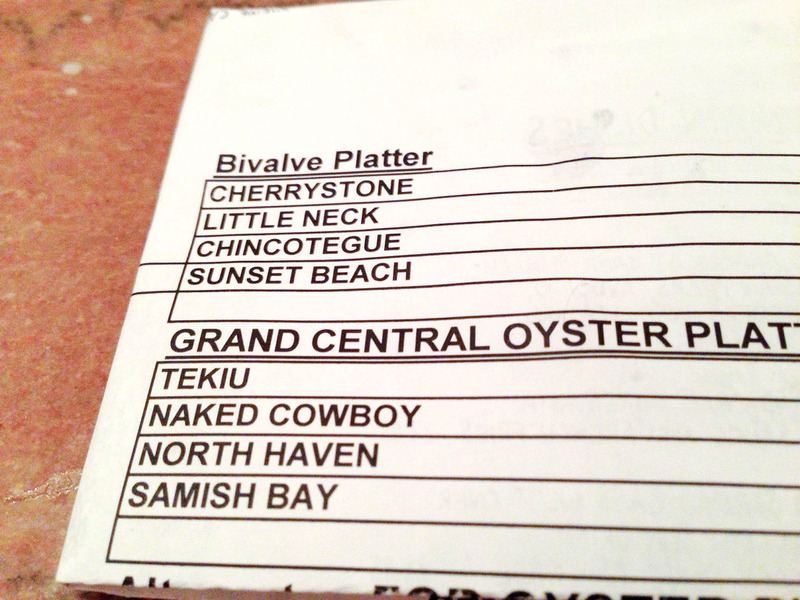 We started with the Grand Central Oyster Platter. They tasted distinctly different. Some were very sweet which surprised me. There was an underlying saltiness with them all and I had them with no accompaniments. Just the oyster slurped down on it’s own. I then decided to try the Pan Roast because I wanted to see how the chefs would use the odd saucepan contraption. I wish I hadn’t. 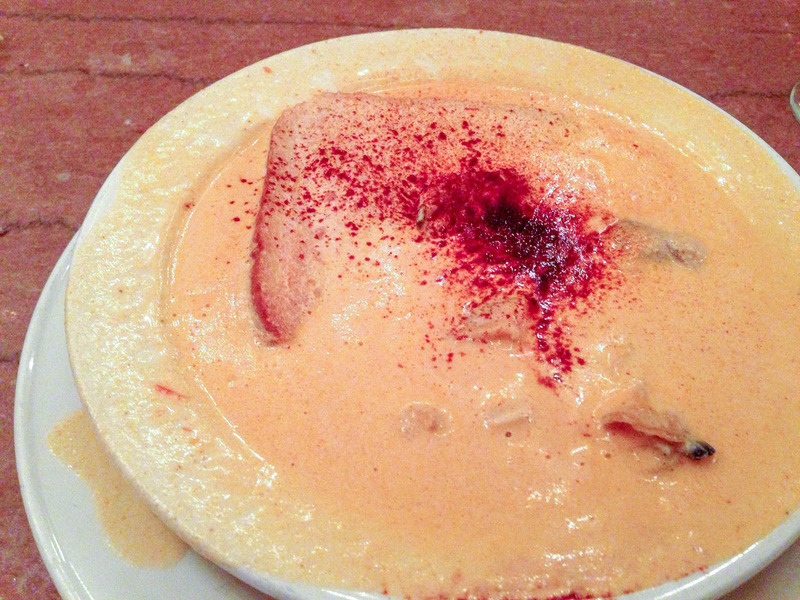 It was so rich and creamy and after all the oysters I started to feel a little woozy. As a lunchtime treat with some crusty white bread it would have been delicious. 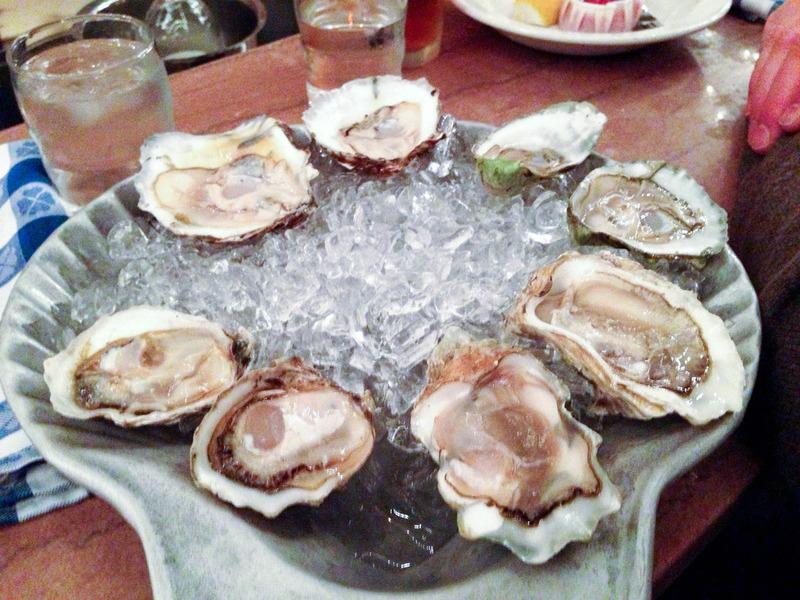 Back to oysters, I looked at the old menu board for inspiration and chose all Long Island varieties and again was surprised at the different sizes and tastes. A few salty ones in this batch. Delicious nonetheless. I was so full at this stage. They seem small but these little gems are ever so filling. It had been a brilliant evening. Great company and laughter with old friends but also an opportunity to marvel at this gorgeous vaulted ceilings and decor. It’s a beautiful restaurant with old traditional American values. Seek it out. It’s a New York institution and will be for many years to come. You’re a brave woman – i’ve tried them once and never again!!!!! Oh no! Give them another go honest they were really good. Filling and healthy too. This place had such an awesome range. I adore oysters, I didn’t realise they were a “thing” in New York although they are, now you mention it, always eating them in Mad Men! How fab is that blue header on that menu? Fab graphic design. I would definitely head here if I made it to my fantasy trip to New York one day. I would not have known this place without our friends taking us. It’s a beautiful building too. All domed ceilings and open plan table layouts. Lovely little pit stop or in our case a full meal! Looks glorious! Very much enjoyed this as a Friday tea-break read, transported from a drizzly day to a New York bar. Have lovely memories of oysters in Brittany and West coast of Ireland, but not quite as cool as this. Oh I know that you mean. I transported back writing it up. I was so surprised at all the different flavours. Not at all fishy in some cases but rather sweet. Beautiful wine too. I must visit Ireland. Have never been but the coastline looks so gorgeous. Great article! Now I am starving…. I’ve just booked a trip to New York and definitely want to see Grand Central. 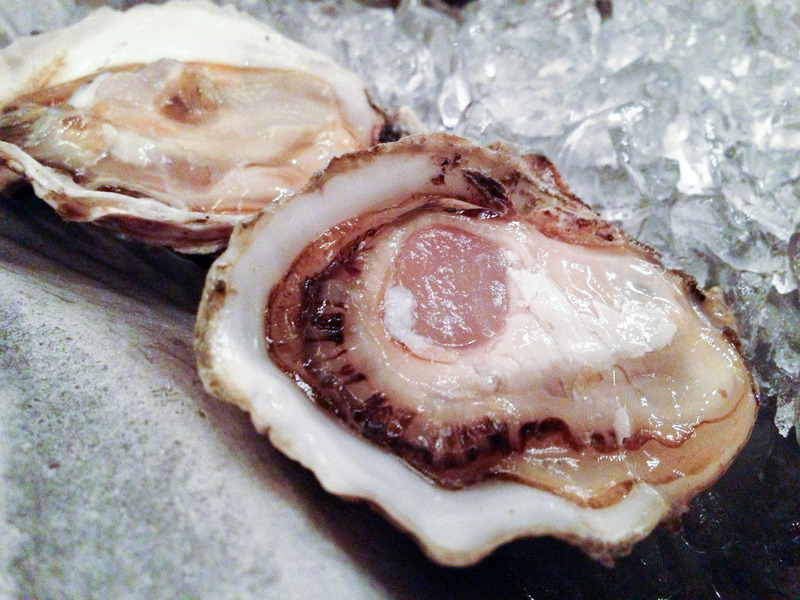 Might have to stick to a glass of wine and some other type of fish though…oysters don’t agree with me unfortunately! They had lots of other fish on the menu so I’m certain you’d find something to suit. Worth it for the decor and walk through food market. Thanks for the tip! So much to do and see in New York… I can’t wait! Also seek out the high line. Lovely walk. Pick up lunch at Chelsea market and then get off about half an hour later for donuts at the donut place! Wow! I am off to DC later this year and definitely will be popping to NY for a few days. 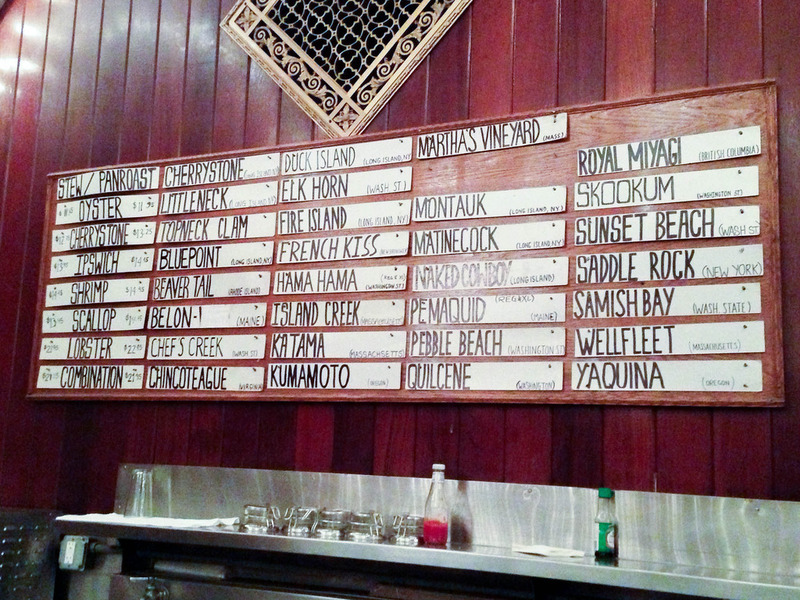 30 types of oyster? Where do you start! 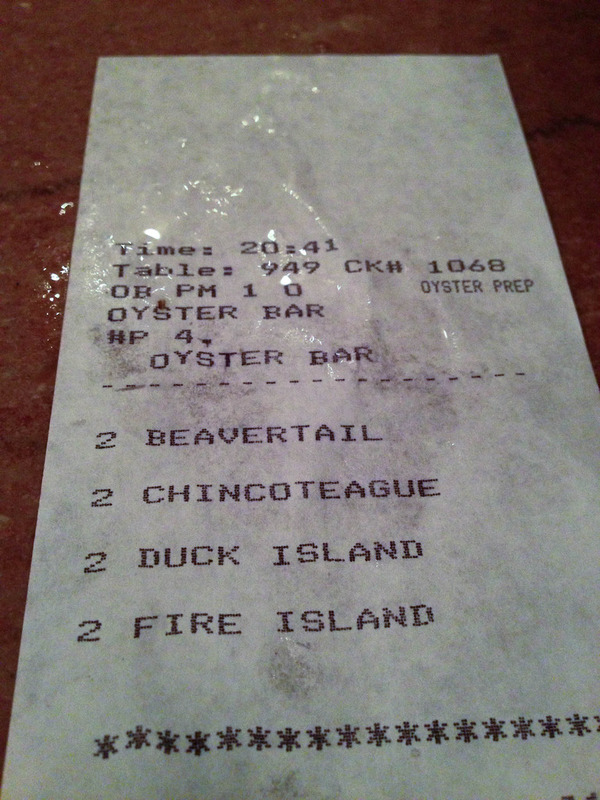 Strange but true – I’ve never had an oyster. Just can’t seem to bring myself to have a go! The pan roast looks interesting! It was but I think on another occasion when I hadn’t had wine!